This is another project that has taken years to complete. Like most of my projects, they are in my head and on my to-do list for a long time before I even start them. I finally started it this past summer and completed it around Thanksgiving. We finished the bathroom remodel and installation about the end of December, but I didn’t take photos until recently. The vanity is 61½ inches long and built in three sections to make installation easier. I had already completed the left and right sections and had started the doors for the center section when I stopped to purchase a vanity top at Leslie Marble on a trip to visit Dad. I had planned a 60-inch vanity and since this vanity top was 62 inches long, I had to refigure the center section because I only wanted a half inch overhang on the left. The center section was made without a back and the shelf was added once the right section was installed so I could cut around the plumbing pipes. I like lots of shallow drawers . . .
. . . so I made the pullouts to hold taller items. The right pullout houses a wastebasket. I used a rosette cutter on my drill press for the center of the medallion on each pullout and my husband added a little more with the lathe to enlarge the design. When our grandchildren were little and needed to use a stool to reach the faucet, I decided that the next vanity would have a step for them. That was 20+ years ago and all of our grandchildren are now adults. If we’re blessed to have great-grandchildren, they will get to use it, or maybe the next owner of this house, or maybe it will never be used and just be a novelty. Better yet, possibly someone will like the idea and incorporate it into a vanity he builds for his children. Instead of scribing the back of the vanity top, we notched a trowel to fit against a straightedge for mudding the wall flush. This worked remarkably well for a tight fit of the vanity top. My next project needs to be a small cabinet for the wall at the right end of the cabinet. Even though I wasn’t anticipating it and don’t have it on my to-do list, I hope to bypass some of the other projects on my list and get it done soon! 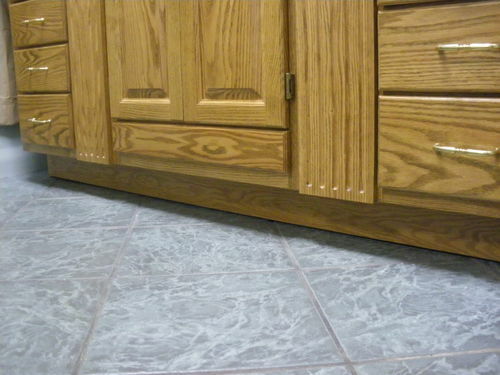 great design you really utilized the space.that pull out step for the kids is a great idea,and will get copied many times im sure.my wife is only 4’11” so i incorporated a pull out step stool in our kitchen cabinets that folds flat and stores in the toe kick space.nice job. Looks good. That step stool is a great idea. Thanks Larry and Bob for the encouraging words. I just hope the wall cabinet will get done a little faster! Wow! That is nice! I need to learn how to make drawers like that, well doors too. Haha. Very pretty. Only 20 years. LOL! Well the wood has aged and probably won’t crack . Another off the todo list? Well thought out! Doc, only the idea is that old; the wood was milled off our land (I’m too cheap to buy wood) about ten years ago. I’m only half as far behind on that part! Thanks both of you, for your comments. Wow … that is totally the best bathroom vanity I have ever seen!! Over the top with the coolest storage ideas. WELL DONE!!! Thanks for the nice compliment. I do really like to figure out storage ideas, probably because I’m one of those “stock-up” shoppers. I hate shopping so when I do shop, I want it to last for a while and need a place to store it. Nice to hear from you. Have you done any marquetry or intarsia projects lately? No toe-kick: what’s the rationale for this decision? Does it cause you to stoop to reach all of the counter and faucet or don’t you notice? Very nice vanity great design and utiliztation of space, great workmanship. Job well done! fuigb, there is a toe-kick, 3½” deep by 4” high. Maybe this photo will show the toe-kick more clearly. oldrivers, thank you for your encouraging comments. Ah, I see it now. It looked as though you’d not included a toe kick, and so the question/assumption was that one would need to lean over and stoop to reach across the counter. I’m tall and poorly-designed workstations are agony for my back, and I wondered if perhaps you found a way to thrive without a toe kick. Never mind! Great job and nice dovetails. I can see why it took so long. A lot of wonderful craftsmanship. Your a pro. And congratulations on you top 3 project award. James, thank you for your compliments. I’m far from a pro, but I do try hard :-). Hi W/L … I was tripping on home from sunny Blythe, California to not-so-sunny Vancouver Island … my excuse for not replying sooner! I’m a “stock-up shopper” myself. Why waste time shopping when we’d rather be playing in the workshop, eh?! Once our travel dust has settled, I’m looking forward to some workshop time … and yes, I do have an Intarsia project (still in design stage). I’ll post as soon as I can! !